Day 13 of 30 Days to a Food Revolution. 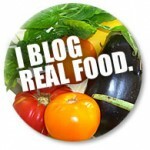 Today’s guest blogger is Melissa from Gluten Free For Good. Holistic nutritionist and fresh food advocate, Melissa McLean Jory, was diagnosed with celiac disease several years ago. She specializes in nutrition therapy and exercise science in her private practice, blah-blah-blogs about it regularly at Gluten Free For Good and believes true health and healing takes a mind-body approach. 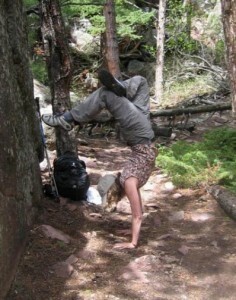 As an avid backcountry enthusiast, she finds no limit to nutritious gluten-free cooking, whether in the comfort of her kitchen or the wonder of the wilderness. Eckhart Tolle is a German-born spiritual leader, philosopher, writer and public speaker. Although I doubt he was thinking of bok choy, beet greens or cauliflower when he expressed the above sentiments, I’m taking this literally and applying it to Jamie’s Food Revolution. I also doubt Jamie was thinking spiritual transformation and enlightenment when he temporarily banned French fries at Huntington High or took those nasty pseudo-nuggets off the menu at the local elementary school. I can’t separate one from the other and even if Eckhart and Jamie have never even heard of each other, they’re both on a revolutionary journey of transformation. Body, mind and spirit. One infuses, influences and inspires the other. Without a healthy body, without an interest in what goes on inside, the outside won’t fall into place. So, let’s do it! Can you hear us, Jamie? We’re on board and ready to flash dance, sing, cook, twirl, eat fresh food and make a change from the inside out. Here are my food tips for revolutionary and enlightened transformation. Eat whole, fresh food. Preferably organic. Check here for the EWG’s shopper’s guide to pesticides (the dirty dozen and the clean 15). Make whole plant sources, especially vegetables, fruit and legumes your foundation. Choose foods (for the most part) that you can hold in your hands and wash. Can you wash a box of Kraft mac and cheese or a package of Twinkies? You can wash tomatoes, cabbage and leeks and you can rinse brown rice. See how easy that is? Don’t eat food that never spoils. If it doesn’t rot, it’s not real food. If animals, insects and bacteria won’t eat it, maybe we shouldn’t either. Food that has been sprayed with chemicals to repel critters is not a good choice for people. Here we are at the top of the food chain and the lowly creepy-crawly things are more aware of what they eat than we are. Make it yourself. Learn from your grandmother. Be creative, experiment and have fun in the kitchen. Enjoy and benefit by the wisdom of real food. Eat less, eat slower, use smaller plates, join a CSA, frequent farmer’s markets, choose fresh ingredients, eat more vegetables, choose humanely treated and pastured animal sources and skip the junk food. Nutritious food comes from good ingredients. Part of healthy eating is enjoying what you eat, how you prepare it, the cultural variations and sharing it with others. Don’t make it complicated. As Alice Waters (hers is a Delicious Revolution) says, “be inspired by recipes, rather than ruled by them.” Have fun and remember – wholesome food is a gift to appreciate. Peel and roughly chop the carrots. Slice the celery. Peel anc roughly chop the onions. 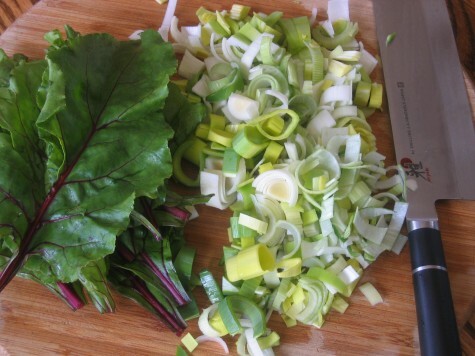 Cut the ends off the leeks, quarter them lengthways, wash them under running water, and cut them into ¼ inch slices. Peel and mince garlic. Put the broth in a sauce pan and heat until boiling. Place a large saucepan on medium/high heat and add 2 tablespoons of olive oil. Add all your chopped and sliced ingredients and mix together with a wooden spoon. Cook for around 10 minutes with the lid askew, until the carrots have softened, but are still holding their shape, and the onion and leeks are lightly golden. Peel the potatoes and cut them into ¼ inch dice. Add the boiling broth to the vegetables. Add your potatoes. Give the soup a good stir and bring to a boil. Reduce the heat and simmer with the lid. Remove the pan from the heat. Season with salt and pepper. Serve like this or pulse until smooth using an immersion blender. Top with some crumbled cheese or roasted sunflower seeds if you’d like. For more information on ingredients in this recipe, visit Melissa and read Far Out Revolution. What a great post. I love potato and leek soup. This soup looks AMAZING! I was just looking at leeks yesterday thinking I want some of those. But with no recipe "in mind" I passed them up. I will be going back for them and the beet greens! The recipe looks great! I will definately be making it. I like the 8 food tips. I will be thinking of those as I am preparing food for my family! Melissa – your tips are tops, the recipe looks fantastic and I love your gluten free for good blog. You really know your stuff and have such a relaxed and entertaining way of sharing important information and hard facts, I forget I'm learning. Thanks for this post! Yum, the soup sounds great right around now! I'll add it to my repertoire! Humor. I especially love the tip about not being able to wash a box of mac and cheese. Great visual! Thanks for the wonderful post. Yet another informed blogger adds her voice to Diane's wonderful event. I am honored to have been a part of it. Hi everyone — thank you so much for your comments and support. I really appreciate it. And thank you, Diane, for hosting this wonderful event. What a great idea! You've given Jamie's revolution a blogger voice. I love it! Let's keep this revolution going and stick with fresh, whole foods! Peace, love and fresh food. It's soup time in Colorado! Cold and snowy, if you can believe it. Funny, I never thought of humor in the visual of choosing foods you can hold in your hands and wash, but it seems to work for the most part. Laughter is good! Kelly & Shirley (and everyone else) — thanks and to be honest, I'm trying like crazy to be more concise with my writing. Say more with fewer words is my current goal. 🙂 I think Michael Pollan said it best when he said, "eat food, not too much, mostly plants." It really doesn't have to be all that complicated. I'm not a big fan of leeks, so I don't know if I'll try this soup. But thanks for the suggestion of using beet greens. I've never done anything with them but toss them. I'll definitely keep them next time and add them to something. Sauté them just like you would spinach. They're delightful. Add them to soups, stews, stir fry. I like them better than almost any other green. Thanks so much for your tips! I had to laugh at the part about 'bok choy, beet greens, or cauliflower,' because my 3-year old son eats all three of these frequently (and he does not have a lot of foods that he can eat). His allergies have definitely changed the food products that enter our house, as we've become very aware of ingredients! Melissa, THANK YOU for this tip, my new favorite line: "Choose foods (for the most part) that you can hold in your hands and wash. " It has run over and over in my mind and it's so true. This little quote is a keeper. Great post! Your food points are great, but we need Jesus! Beet greens are such a fabulous addition to the soup – love it! I really like point #5! If animals recognize and avoid this food as poisonous, why on earth are we eating it?